Cut signature autographed in blue ballpoint on green paper by the late, great Kansas City Chiefs Hall of Famer Buck Buchanan (he added K.C.C. 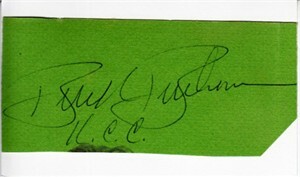 to his signature) mounted on a 3x5 index card. Buchanan died in 1992. With certificate of authenticity from AutographsForSale.com. ONLY ONE AVAILABLE FOR SALE.